You can also add a “Restrict where this job can run” value in the job itself, thereby limiting the job to running on a certain node. What is slightly trickier, is to have the node a job runs on selected dynamically at job run time, for example, having the node be based on the value of a variable or other parameter. However, the NodeLabel Parameter Plugin does also support this, when used in combination with the Parameterized Trigger Plugin. When both plugins are installed, a new parameter type is available in the ‘Trigger paramaterized builds on other projects’ section, specifically the NodeLabel parameter. This allows you to set the node to be used on the triggered job. To set that value dynamically, you need to also use the EnvInject Jenkins plugin. You then select ‘Inject environment variables’ and give ‘tmp.properties’ as the value for ‘Properties file Path’ field. The file content (NODE=qaserver in this example) will be injected in the job. 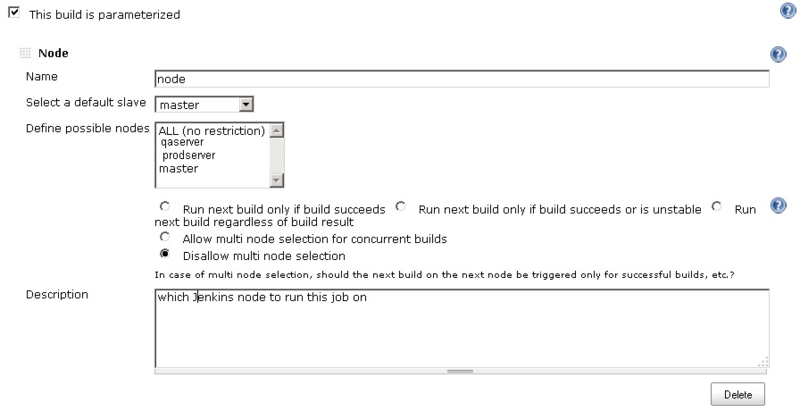 Now we can use that variable ($NODE) in the jenkins job. That’s it. In this example, we are dynamically setting the node that the Server-Setup job will run on, based on the value of the Environment parameter. The solution is a little complicated as it requires 3 plugins (NodeLabel Parameter Plugin, EnvInject Jenkins plugin, Parameterized Trigger Plugin) but it is the only way I have found to make this work! 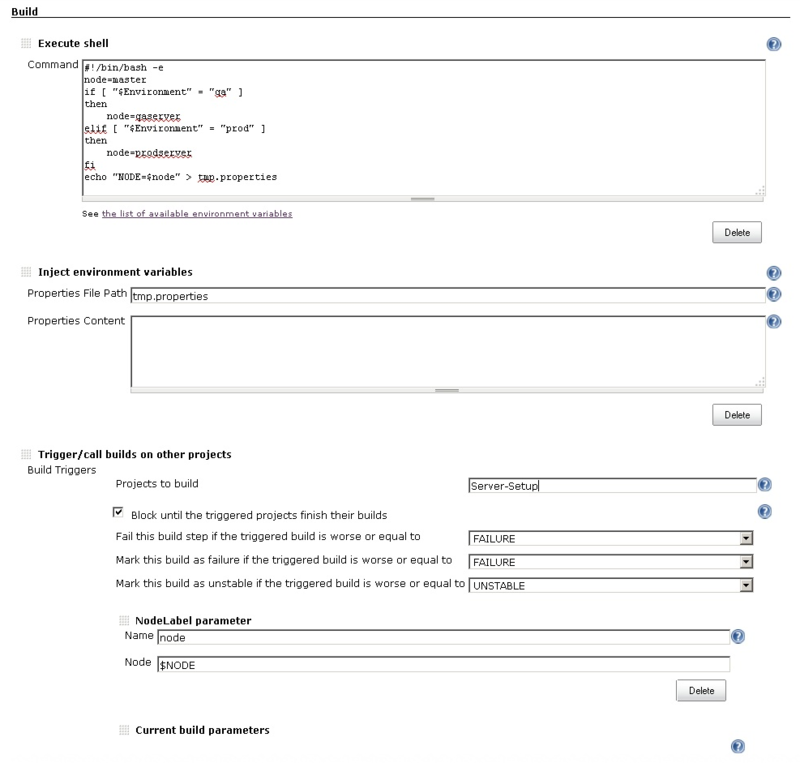 10:30:07 [EnvInject] – Injecting environment variables from a build step. 10:30:07 [EnvInject] – Variables injected successfully. 10:30:08 No emails were triggered. Seems like I am just a nudge away from having this knocked out. Any ideas? Thanks for your contribution! Hi, the example above works fine for injecting a single node into the job. Any idea how to inject multiple node names for running a job on multiple slaves? I’ve tried a number of comma delimited values in the properties file, but this doesn’t work. Hey Leslie, sorry really not sure, it’s been a while since I worked on this. If you do find a solution for multiple nodes, I’d love to hear it though! The project runs concurrently on all slaves in $NODE. Glad you found the solution Leslie, and many thanks for posting details back. Thank you for he article Shaun and thank you Leslie for posting your solution. That was really helpful. Thank you for this blog post! I have found it (and Lesie’s comment/solution) very useful. With that, I have a question which is related. I have search “high and low” and am wondering how I can provide a unique “Job count” to each of these jobs I have now scheduled? I have scheduled 1 job to run concurrently on 3 different nodes. I want to pass a “1” to the first node, a “2” to the second, etc. In each of the jobs, I’m pulling from source control a very large static dataset, but I do not want the jobs to duplicate the processing of that data. I want to use this value to partition the data each has to process. Thank you again very much for this solution! Great question. I haven’t tried. Will post if I can think of a solution. Again, like Leslie, it would be great if you post back a solution if you think of one!